My favorite: "They show an expert understanding of a subject area or topic"
Something I struggle with. If I really know what I am talking about, I should be able to make it easy to understand and "get" to someone who sees it. 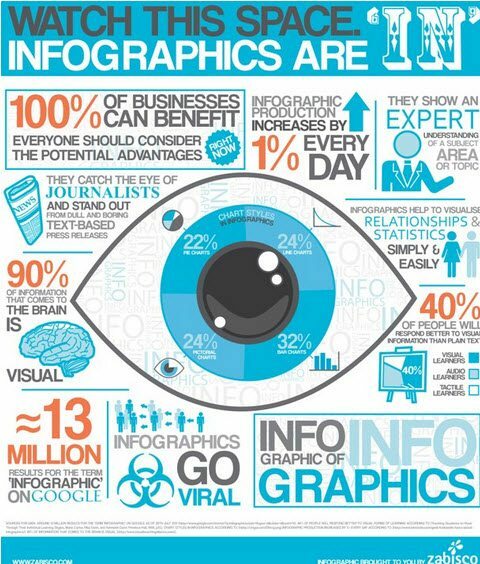 Do you know of any good resources on "how to create infographics"? Supposedly, http://visual.ly/ is creating a "lab" for future members, but they haven't gone public, yet. I have asked the same question but have not found a simple software to do it. But I will be on the lookout. I use Mindjet MindManager for creating mind-maps. I am going to give it a closer look as a way to create infographics.Will let you know what I find out. I remember buying it for approx $200 a couple of years ago. Here's a perspective from their blog: What is Infographic Thinking? Ok, here is a way to create a super-simple graphic we can use for Pinterest from the Wizzle. I have visited some articles that I would like to pin but can't because it does not have a large image. I used a tool called wordle.net to convert the wizzle text to a tag cloud. There are many different fonts, colors and shapes you can use. My following example is a quick and dirty one. I look one of my most verbose articles - which wasn't hard to do :) - and copied and pasted the whole thing to notepad and then copied and pasted it into the wordle tool. Converting the result to an image is a bit tricky but not hard to do. I printed the art as a PDF and used a PDF to Image converter to create an image which I included in the wizzle and then pinned it using pinterest. All tools used are free. I am finding a ton of tools to do such things for creating infographics. I don't know if it's useful to the community. If it is, please let me know if you think it's a good idea for me to create a quick wizzle with step-by-step instructions - for this tool and other similar tools. In a pinch, you might be able to illustrate your idea with a cartoon. And I like the suggestion that we all live on a different planet, sending all the good stuff to those crazy Earthlings.